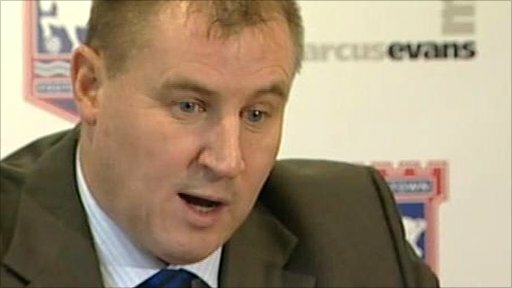 Paul Jewell has been appointed as the new manager of Ipswich Town. Jewell, who has signed a two-and-a-half-year deal, has been out of work since resigning as Derby boss after a 1-0 defeat by Ipswich in December 2008. "I've actually enjoyed my time out and I've done a lot of re-evaluating mistakes I've made in the past," the 46-year-old told BBC Radio Suffolk. "I've had four or five offers but I was starting to get really hungry and was missing the day-to-day of football." Previous boss Roy Keane was sacked on Friday after a run of seven losses in nine games left Town three points above the Championship drop zone. Jewell will not take charge until after Wednesday's League Cup semi-final first leg tie with Arsenal at Portman Road. Coach Ian McParland will continue to take care of first-team affairs until then. The ex-Wigan and Bradford striker found managerial success with his former playing clubs, winning promotion to the Premier League with both sides. Ipswich owner Marcus Evans told the club's website: "I wanted to appoint a manager with several years of experience behind them who also had a history of promotion and then staying up. "I have been lucky enough to find a manager in Paul who has done that twice and pertinently with two clubs that had never been in the Premier League. "It was also important to bring someone to the club who could play the way Ipswich expect the game to be played and who will embrace the club's role in the community." The new manager has yet to compile his coaching team but Chris Hutchings, who was Jewell's assistant at Bradford, Wigan and Derby, is available after being sacked as Walsall boss last week. "When a new manager comes in they normally bring in their own staff," said Jewell. "But I'm not saying anything's set in stone because it only happened last night. "I've made tentative enquiries about who I'd like to bring here, but whether I can or not I don't know." Jewell's 13-month spell at Pride Park saw the Rams relegated from the Premier League and he left with the club 18th in the Championship. In 1999 he led Bradford to the top flight for the first time in 77 years and managed to keep them up a year later. A forgettable spell with Sheffield Wednesday followed, where he lasted just six months and was sacked in February 2001 after 12 wins from 38 games. But Jewell was back in the Premier League in 2005 after leading Wigan from League One to the top flight in three seasons. The full extent of the task in front of him was underlined on Sunday, when Town were hammered 7-0 by Premier League champions Chelsea in the third round of the FA Cup.